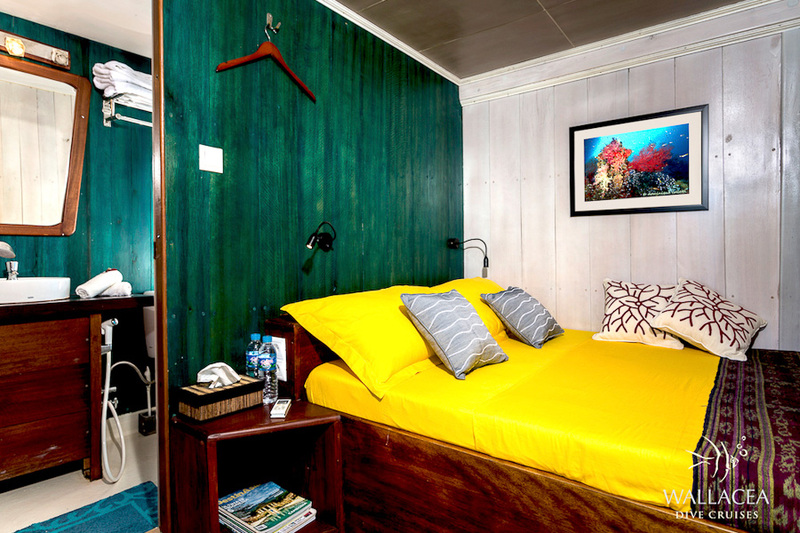 Ambai liveaboard - Indonesian liveaboard diving - Book now ! The MV Ambai is a new 32 meters boat started operations in July 2012. She receives up to 16 divers in absolute comfort. 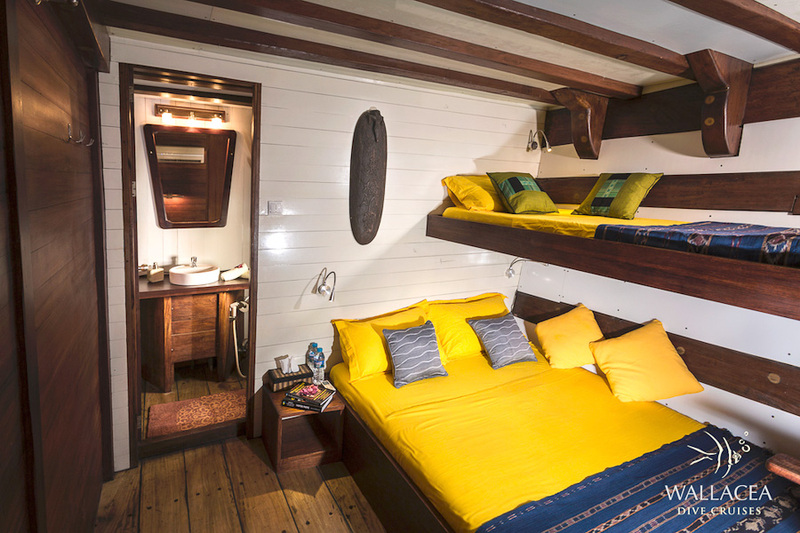 Traditionally built from Iron wood and other tropical hard wood, the boat is however especially designed to offer the best liveaboard diving cruise experience. 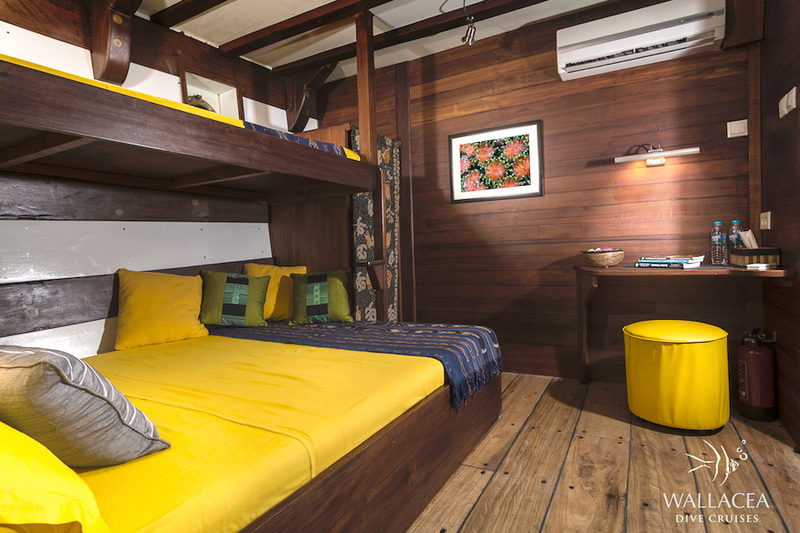 Ambai Liveaboard has 8 boutique cabins with individually controlled air conditioning and ensuite bathrooms with hot water. An inside lounge and restaurant, large shadow deck areas and a Sun deck complete the common parts. 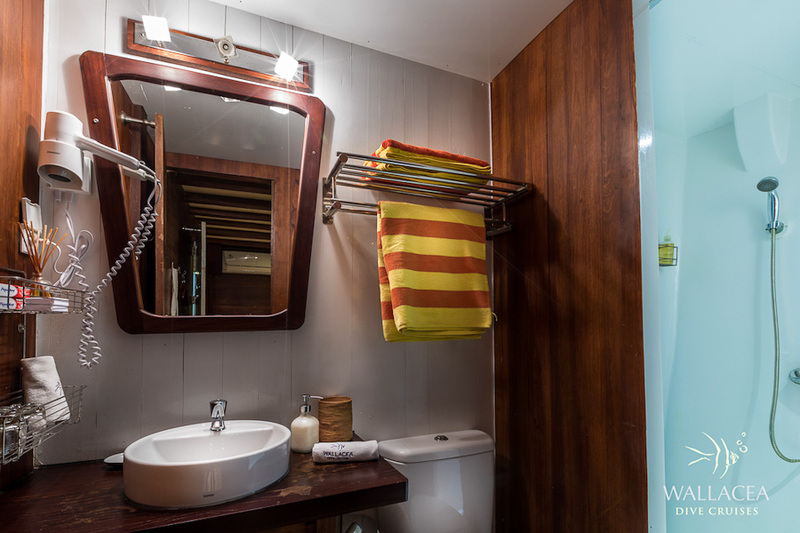 Photographers will enjoy a dedicated room for the maintenance and preparation of their camera, as well as a large screen in the lounge to share pictures and videos. At the rear of the deck, a large dive deck extended by a platform offers an easy and direct access to the three dive tenders. Last but not least, the staff aboard the Ambai is always ready to provide you the best service at anytime. All you need to do is to enjoy the dives, and let them take care of the rest - even loading and unloading your heavy diving equipment! - Ambai offer free Nitrox to qualified Nitrox divers. 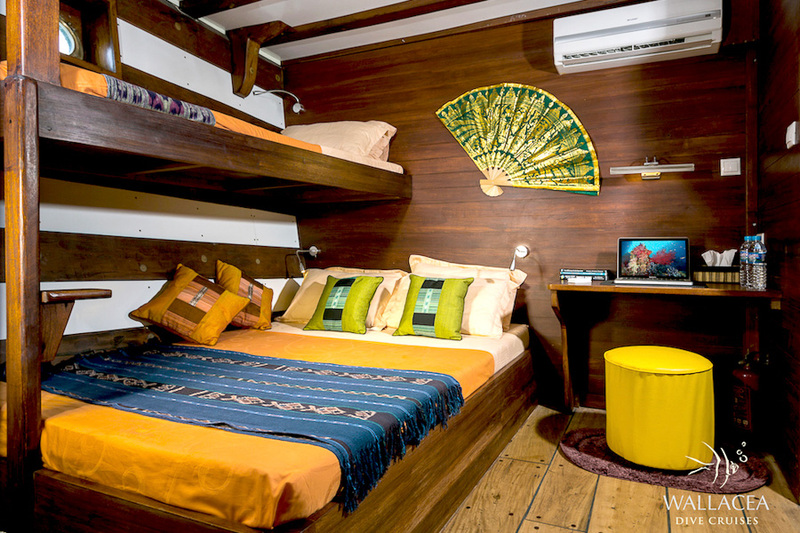 Accommodation in a double-bed or twin-bed cabin. Three daily dives plus some night dives according to the itinerary. All the dives are subject to weather conditions and transit time. There is no diving on the days of arrival and departure, and there are only 2 dives the day before departure. On relocation cruises, long passage time can reduce the number of dives available. Multilingual guides on board (Europeans and Indonesians). Land excursions, according to safari program. Transfer from the airport to the boat and back to the nearest airport only (depending on cruise destination). Domestic flights to or from the departure airport. 70 % is due to 90 days prior to departure - non refundable. Highlight : World’s best region for marine biodiversity, schools of fishes, macro and outstanding landscapes. Raja Ampat is an archipelago consisting of four main islands—Waigeo, Batanta, Salawati and Misool—surrounded by over 1,500 smaller islands and reefs. This region is part of the West Papua province in Indonesia. Raja Ampat certainly represents the world’s richest marine diversity, with the highest number of known species of fish, corals, and mollusks. Certain areas are known for their density of fish; one with groups of Manta Rays, the others with schools of barracudas, parrotfish, humpback groupers and the list goes on. Not to mention the best macro you will see everywhere. Photographers, please bring your full set of lenses: wide angle & macro will delight you equally. The rich variety of reefs are also not to be overlooked with vertical walls, slopes, dry rocks, caves and lagoons; some covered with hard corals while the others with brightly colored soft corals. Also renowned as the center of pygmy seahorses and gorgonians, everywhere you go you will be amazed by the profusion of marine life that Raja Ampat has to offer you. Raja Ampat also offer magnificent landscapes for you to explore—labyrinths of quartz islands, vast mangrove forests, deserted beaches and lagoons. You can also go for a tour to the small villages in search of the famous birds of paradise. Our 11 night scuba diving liveboards cruises are one of the very few that visit all the Raja Ampat, up to Wayag on the North and down to Misool, with a selection of the very best scuba dive sites of all the area. Raja Ampat is definitely a must see. Sorong – Kaimana: Raja Ampat – Triton Bay itinerary (subject to change based on weather and sea condition). This is the perfect cruises to fully enjoy East Indonesia’s finest marine biodiversity. In this program we take you not only to dive the world famous Raja Ampat, but also to explore West Papua further south in Triton Bay in Kaimana district. The beauty of its amazing soft corals that stick out to the surface is definitely one of the major marine attractions in Triton Bay. There are over 959 different kinds of coral fish and 471 known types of coral in this area. The other highlights include black coral forests, overflowing schools of sweetlips, vibrant macro lives, and a good chance to encounter whale sharks on “bagans”—the fishing platforms where these giants come to visit from time to time. The other part of the cruise will allow you to discover or rediscover Misool with its magnificent reefs that are certainly among the most beautiful reefs in the world. Labuan Bajo – Labuan Bajo itinerary (subject to change based on weather and sea condition). Located in the strait of the same name at the confluence of the Indian Ocean and the Banda Sea, The Komodo National Park features one of the world’s richest and most diverse marine environments—thanks to the overflowing currents in the area. Also renowned as the home of the famous Komodo Dragon, it is certainly one of the best scuba diving destination that you can find on the planet. In the north, you can find a collection of the world’s most beautiful varieties of reefs, boasting a rich combination of hard and soft corals, shoals of antheas, wrasses, angelfishes, and also predators—reef sharks, tunas, and giant kingfishes. In the south you will see more soft corals with amazing profusion of colors, and even more macro (and manta rays too!). The water is rather cold and the temperature can drop down to 23 ° C in July and August. Komodo offers a wide variety of dives: pelagic dives with sharks in strong currents, gentle drift dives, wall dives (colorful drop-offs, monumental boulders, seamounts, pinnacles and sandy slopes) and macro dives. You can also find manta rays, turtles and, if you are lucky enough, some whale sharks ! Bali is just 90 minutes away by plane… but 25 hours by boat! To avoid wasting time in navigation, and to focus exclusively on the Komodo Park, we offer 9-night scuba diving cruise liveaboards from Bima, arriving in Labuan Bajo and vice versa. Find out more on our itineraries by clicking on the links provided above “itinerary”. For the schedule of our Komodo scuba diving liveaboard cruises, please click on “destination trips”. As the currents in Komodo can be intense, a good experience with current dives is highly recommended. To dive in this area you must be advanced level PADI/CMAS Level 2 or higher, with a minimum of 50 logged dives in the sea. Therefore less experienced divers can also participate with a specific supervision that has to be arranged before the cruise. Maumere – Ambon: Banda Sea – Ring of Fire itinerary (subject to change based on weather and sea condition). From Maumere (Florès) to Ambon, the main city of Molluca islands (with some muck diving challenging the Lembeh Strait) will bring you across the Banda sea and the ring of fire, steeped in history and blessed with some of the finest diving in the country, with an immense variety and volumes of both large and small species. traveling for about 850 nautical miles. We visit many different islands and a great variety of dive sites. We then explore many islands of the Banda Sea along the way, like Wetar, Rampong, Terbang islands, Seroa and Manuk, an Island inhabited by birds and by sea snakes underwater. There are no long passage distances, so we can perform the three dives every day. 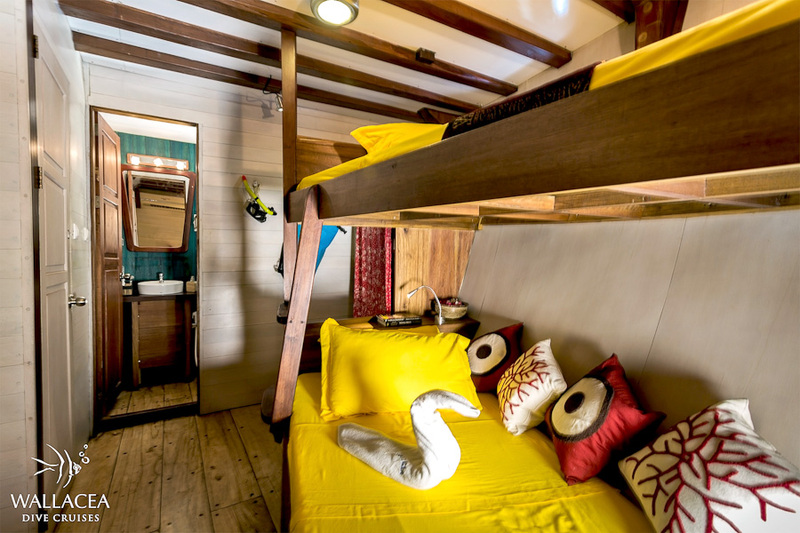 Capacity : 8 double guest cabins: 6 on the lower deck, 2 on the upper deck. Air conditioning, private bathroom, hot water. Crew : 16 crew including 4 dive guides. 1 western cruise director/ dive instructor. Raja Ampat Ultimate ** SPECIAL -15% ** Special offer down from 3,400 Euro to 2,890 Euro ! Raja Ampat Misool & Dampier ** SPECIAL -10% ** Special offer down from 3,060 Euro to 2,754 Euro !